When you write, post or create something in SharePoint, you most likely want to make it easy for the appropriate people to find it. A link is most often the best solution, but a link can be created in various ways. The tutorials about links in our series SharePoint Online from Scratch have now been published, and I hope you will find them useful. My demos are recorded in Office 365 SharePoint Online, but links work in the same way for SharePoint 2013 on-premise. 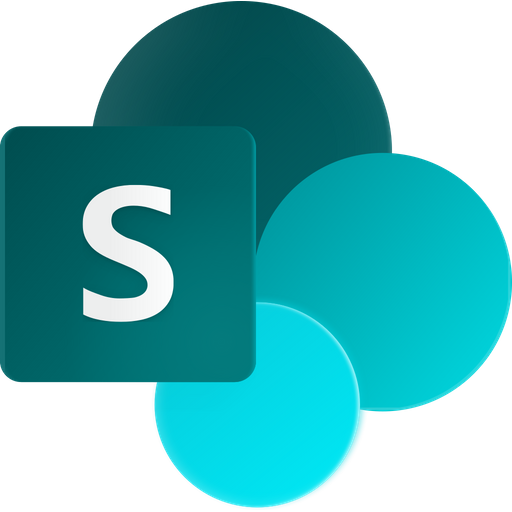 SharePoint is a web-based application, so links are at the core of everything. Every clickable navigation link, button and image use the same hyperlinking technique, and therefore it is crucially important to understand the concepts behind linking and how to make your own hyperlinks. Everything on the web has an address, also called a URL (Unique Resource Locator), which at least contains a protocol, most commonly http:// or https://, and a domain, such as kalmstrom.com. The URL can also contain a more exact specification of which file is to be displayed. Additionally the URL may have parameters that indicate what part of a page should be focused or displayed. Inserting a link in a text, like 'here' in “There are lots of more tips articles here!” is easily done from the INSERT tab in the ribbon. When the link has been created you can edit it, for example decide if the link should open in a new tab or not. It is common practice to open a link in a new tab when it points to content outside your main content area. When editing the link, you can also add a small document type icon next to it. That icon is especially useful if you are linking to a document with a recognizable icon, such a Word document or a PDF file. Image links are popular, and users often expect to be able to click on images to know more. When you insert an image in SharePoint it will not be clickable by default, so you will have to do the extra work of selecting the image, inserting a hyperlink and deciding what should happen when you click on the image – usually the user is taken to another web page. Making parts of an image clickable and linked to different locations is slightly harder to do, since the editor in SharePoint does not yet have this capability. The process involves creating a map of the areas in the image that should be clickable. You can do this manually by editing the html code but that is a bit tricky and prone to errors. Therefore I show you no-code ways of doing it with Visio, PowerPoint and Excel. 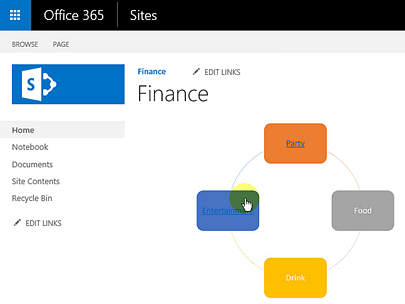 When you first create a SharePoint team site, it has links in the shape of moving tiles on the start page. These links are called promoted links, and in two articles we describe how to create images for promoted links and how to add promoted links to any SharePoint page. If you are linking to content within your site, SharePoint offers a functionality to help you build links to existing pages, views and items within that site. You can also link to non-existing pages, which is way more useful than it sounds. This technique is known as wiki linking. The hardest part about wiki linking is the syntax – double brackets before [[ and after ]] the text you want to link. When you start typing the two double brackets the SharePoint editor helps you with a little drop-down. I recommend that you use your keyboard to navigate this drop-down. If you want to change the caption of the link but not the destination, use the pipe symbol for that. In other articles I describe how to use links in SharePoint Newsfeeds and lists and how to link to a shared drive. There is considerable power in using hyperlinks to help your readers find their way through your content, so welcome to have a look at the examples and step by step instructions in the Links articles and demos.